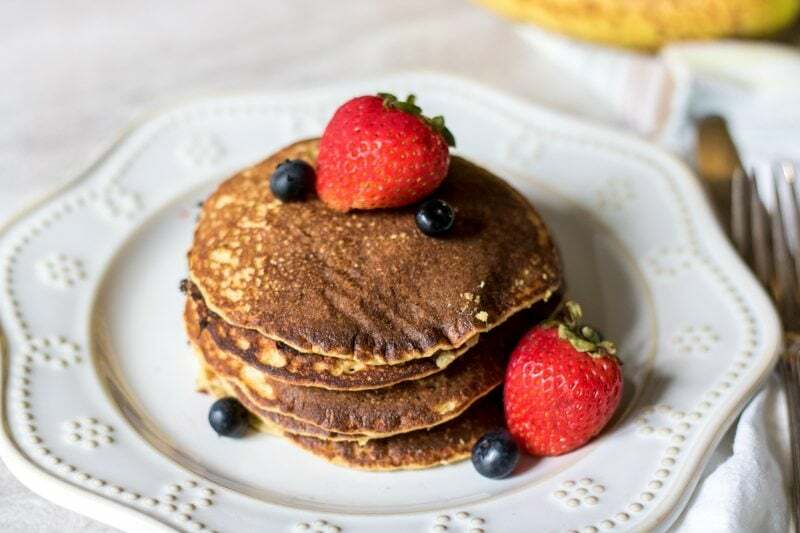 High Protein Gluten-Free Pancakes: Gluten Free pancakes are kept light and fluffy with the addition of cottage cheese–which also boosts the protein in these pancakes, making these pancakes a healthy option for any day. Why my love for pancakes? Well, maybe it has to do with the fact that my family LOVES them and I can guarantee a smile on each of their faces whenever I make pancakes, maybe because it is easy, or maybe it is becoming a Saturday tradition. 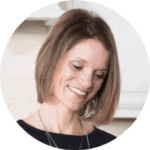 Today, I am sharing one of my healthiest pancake recipes that happens to be gluten free as well. There is a secret ingredient that makes these gluten free pancakes the perfectly healthy breakfast. Are you ready for it? 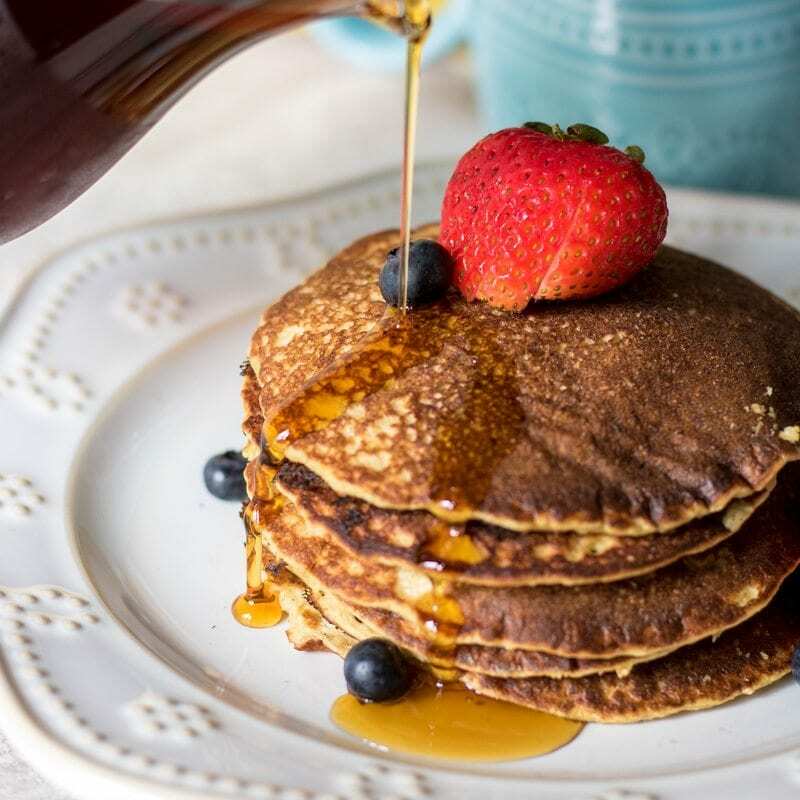 Cottage cheese not only keeps these gluten free pancakes tender and fluffy, but it is also packed with protein and calcium! So for this mama, that has osteoporosis, blood sugar issues, and needs extra protein (all from effects Cystic Fibrosis), I need these High Protein Pancakes! Place milk, cottage cheese, eggs, oats, banana, baking powder and cinnamon in blender. Tip: It is best to place your liquid ingredients in blender first to help the blender work more efficiently! Preheat a large griddle or non-stick skillet to medium-high heat. Lightly grease with butter, coconut oil, or non-stick spray. Once griddle is heated, pour pancake batter unto skillet in 1/4 cup measurements, leaving 1 inch around each pancake. Once bubbles form on surface of pancake, flip gently and cook 1-2 minutes longer per side. Tip: you can tell your pan is ready to cook pancakes when a drop of water sizzles immediately after being dropped on skillet. These cottage cheese pancakes are great topped with sliced banana, fresh berries, and maple syrup. Because these pancakes are made extra sweet from the addition of banana to the batter, you can ditch the maple syrup and spread them with some homemade jam. It is a great idea to make extra pancakes and freeze for future use for busy mornings. Lay out the cooked pancakes in one layer on a cookie sheet and freeze for 30 minutes. Remove pancakes from cookie sheet and and place in freezer safe bag or container. Pop one or more out of the bag at a time and reheat for 2 minutes in toaster oven or microwave and serve. Any variety of milk works for gluten free pancakes. If you don’t want to use cottage cheese, Greek yogurt will work. However, they won’t be as fluffy or tender. Be sure to use certified gluten-free oats if you need these to be 100% free from gluten. Feel free to add blueberries or chocolate chip to batter. Soft and fluffy gluten free pancakes are given a boost of protein with added cottage cheese. Place all ingredients, in a blender and blend until completely smooth, about 30 seconds. Lightly coat a large nonstick skillet or griddle with butter or cooking spray and heat over medium low heat. Drop batter by 1/4 cup onto skillet. Feel free to use any milk in this recipe. It is best to place the liquid ingredients in the blender first, as this will help the blender to work more efficiently. mmmm!! I love everything about these! How simple they are but the loads of protein! Adding to our pancake routine! Fabulous! You will love this addition to your mornings! I wish I was starting my morning off with a stack of these! I have a similar recipe we’ve been making for years, but sans cottage cheese. I’ve been seeing that addition quite a bit in pancakes lately! It keeps the pancakes so light and fluffy and full of protein. Great for people who can have dairy! Kristen, I love how these are packed with protein. And I completely agree with you, just because something is GF doesn’t mean it’s necessarily healthier, but this recipe is. 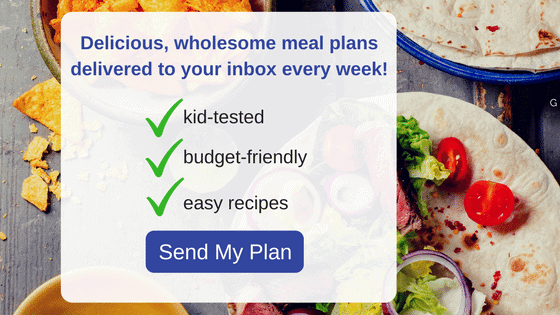 I love your secret ingredient and how you used whole grains! I could eat pancakes all day, everyday! gorgeous GF pancakes, by the way! lovely. Thanks! The teaspoon dropper works great–hopefully it will work for your son as well. These look perfectly fluffy and delicious! The medicine dropper trick is a genius idea! It is crazy how great that medicine dropper trick works! Love the sound of these pancakes. Banana, oats, and cottage cheese–what a great flavor pairing. It is so so good!!! 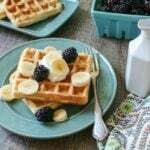 Something healthy that I can make for my boys every morning! And easy enough to make everyday–we had these this morning. YUM!